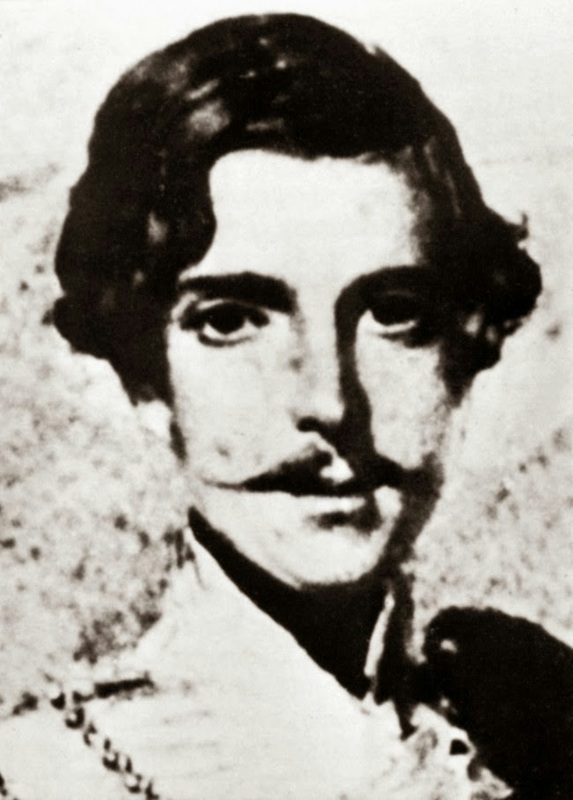 Captain Louis Edward Nolan was one of the most famous cavalry officers of his day, having served in - and trained by - the Austrian Army and with the British army in India. His two books on cavalry were forthright and forward thinking, but yet – probably thanks to Tony Richardson’s 1968 film ‘Charge of the Light Brigade’ - he is depicted as hot-headed villain of the piece; indeed Mark Adkin (‘The Charge’) has gone so far as to suggest that the Charge of the Light Brigade was the deliberate act of Nolan. So who was Captain Nolan? Louis was a model student and model soldier. His riding tutor, Colonel Haas, described him as one of his best students. At Tulln Nolan excelled at riding and equitation, music and languages (his French, German were ‘excellent’ but his Hungarian ‘poor’). He was described as being studious, ‘ambitious and austere’ but his conduct on parade and his knowledge of drill were classed as rather bad. He was popular with all at the school, polite to civilians and, in general, had made a good and favourable impression on his superiors. His brother officers and other friends have erected this tablet as a slight tribute of their esteem and affectionate regard for the memory of one of the most gallant, intelligent and energetic officers in Her Majesty’s Service. The argument that Nolan was impetuous, hot-headed and impertinent seems to derive from the opinions of those who knew Nolan the least – such as the Earl of Lucan – and from those who were trying to clear their name for any part in the disaster of the Light Brigade. As the newspaper reporter Lawrence Godkin wrote ‘dead men tell no tales’. Nolan was commissioned into the 10th Hussars in May 1835 and swiftly became popular amongst all ranks. He attended Victoria’s coronation in 1838 as part of the Austrian delegation as was part of the entourage of Prince Lichtenstein. Sadly, because Nolan was a foreigner, it was unlikely that he could proceed much further in the Austrian Army. Therefore, following several appeals from his father, Louis was commissioned into the 15th Light Dragoons 23 April 1839 and he served with them in India, being invalided home in 1851. Following his return from India Nolan went on a tour of European armies, to study their cavalry. He was particularly impressed by the Swedish Horse Guards under the leadership of Count Stedingk but it was the French cavalry and the French theorist Francois Baucher (1796-1873) which impressed him the most. Baucher was the dressage master at the French Cavalry School at Saumur and head of he famous ‘Cadre Noir.’ He had first published in 1833 his Dictionnaire raisonné d'équitation, "Reasoned dictionary of equitation"; the Dialogues sur l'équitation, "Dialogues on equitation" (with Louis Charles Pellier) followed in 1835; and the Passe-temps équestres, "Equestrian pastimes" in 1840. Baucher's most celebrated work is the Méthode d'équitation basée sur de nouveaux principes, "Method of riding based on new principles"; the earliest extant edition is the third, published in 1842. The numerous following editions up to 1863, when his contract with his publishers expired, are essentially reprints of the same book. The 12th edition, published in 1864 and called the deuxième manière or second manner, contained notable changes from his original method, and was continued in his 13th edition published in 1868. It was in India that Nolan started to ask questions of the British cavalry system: it’s equitation, it’s ability to fight, and more fundamentally, the battlefield role and usage of cavalry. In India Nolan had gained considerable experience of cavalry on active service as well as of irregular native light cavalry. This, combined with his knowledge of European cavalry, led to Nolan seeking out other reformers such as Major John Key. Both Nolan and Key were firm believers in a more natural ‘seat’ for the rider with bent knees (rather like the modern seat) but fell foul of the Riding Master of the 15th – Louis Meyer – who was in favour of the ‘High German’ style of riding with almost straight legs. At this time the British army had no fixed method of equitation, and each regiment adopted the method best thought fit by the Commanding Officer. Not only did Nolan and Keys dislike the riding style then in vogue, but was also highly critical of the swordmanship of British cavalry too which placed great emphasis on performing the correct drill rather than actually being able to fight. Nolan’s first book – The Training of Cavalry Remount Horses – was published in 1852 and he admits he owed a great debt to Baucher whose ‘Méthode has excited much attention.’ Sadly, for Nolan, he failed to grasp that Baucher’s system was highly controversial in France and was not accepted by many. The ‘harshness’ of his system drew many critics and he was thought of more as a circus artist and not a true equestrian. Nolan’s book was rapidly translated into French and gave some credence to Baucher’s system. It is rather ironic, therefore, that Nolan condemned the British system for undue ‘harshness’ yet he praised the work of a Frenchman whose own radical theories were condemned for exactly the same fault! Nolan’s first book was not well-received in army circles as it implicitly criticised the Remount Depot at Maidstone and was thought to attack the careers of many distinguished officers, including Nolan’s former riding master, Meyer. Furthermore, because Nolan was only a captain it was thought impertinent for him to even put pen-to-paper; even worse we was citing European – and French, too – examples, rather than British cavalry as best practice. Furthermore, because Nolan had not seen active service was felt unhelpful, especially in his writing about cavalry versus infantry. Legacy – the Nolan Saddle. So what was the legacy of Captain Louis Edward Nolan? Whilst his was not a lone voice arguing for cavalry reform, Nolan was certainly the most visible (and famous?). He was certainly thought a trustworthy officer, and indeed perhaps ‘authority’ on remount horses: The Duke of Newcastle, aware of Nolan’s books, petitioned Lord Raglan to find a place for Nolan on his staff responsible for the purchase of remount horses. His were the first major books to ask serious questions of the training of the British cavalry horse and ask often damning questions of the British cavalry system. The fact that a mere captain was asking such questions automatically led to disapproval from the army ‘Establishment.’ One of the major criticisms levelled against Nolan - that he had not seen active service in all his 19 years a cavalry officer - was true. His theories were based on observation of others and the experiences of others rather than his own experience of actual combat. Together with David Johnson the saddler sergeant at Maidstone Cavalry depot, Nolan developed the ‘Nolan Saddle.’ The new saddle was tested in the presence of HRH the Duke of Cambridge, the Inspector General of Cavalry, in April 1853. The Duke was suitably impressed and ordered that the new saddle be adopted by the army, commissioning Messrs. Robert Gibson & Co to produce a new model saddle. The saddle was tested on active service in the Crimea and was adopted by the British cavalry in 1856 – 1857. It became known as the ‘Universal Wood Arch Pattern’ and remained in use for 30 years. The adoption and success of the saddle in itself suggests that for the all the controversy Nolan’s writing generated, his ideas were heading in the right direction and a posthumous vindication. If Captain Nolan would have lived it may have had a different outcome, maybe we would not be reading about the ongoing conflict between Lord Raglan, Lord Cardigan and his brother-in-law Lord Lucan after the Charge of the Light Brigade at Balaclava. I have a long-standing affection for Lou Nolan, going back about 40 years when I was given an old copy of the Illustrated London News containing his obituary. What a gifted man. I'd be interested to know what the provenance of the portrait is: is it the long-lost miniature?